The Bumble bees you have in your eaves are probably Bombus hypnorum (tree bumble bee) as their population seem to have exploded this year. Removing them is not an option as it would involve costly scaffolding + a builder to make good tiles etc.. any way bees have an excellent homing instinct and would keep returning to the same place The ones you can see flying in circles outside the entrance are drones waiting for the queen to emerge for them to mate with and they do not have a sting. They only have a very small nest size similar to the size of a birds nest and they will not do any damage to your roof space. They will occupy your roof for the next couple of months while they have their brood. 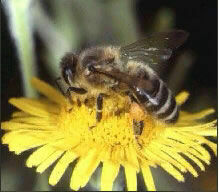 Bumble bees cannot be poisoned and in fact there is a substantial fine if they are poisoned. This is in place because the poison will get in their honey and will inevitably be robbed out by our honey bees and will then end up in the human food chain. Live with them for the next couple of months and just be aware of their flight path, which will be mostly into other people’s gardens and do not bang doors nearby as they may be agitated by the vibration. You can leave windows open at night as they do not fly at night – if you want to leave window open during the day put net curtains or a screen if you want to avoid the odd stray entering by mistake. Once they have gone it would be prudent to fill up their entry point to prevent another colony taking up residence either later this year or next. The bees are not going to harm you or your child, they have no reason to! They do not damage the structure of your property. The only common factor is they occupy a small part of your house in which they are raising their young as well as pollinating plants which provide you with sustenance. Killing them is not an option since the only pesticide licensed for killing bees is only available to professional operators and is restricted to Apis mellifera, used against any of the non stinging solitary bees 200 + types or 26 sorts of bumble bees would be contrary to the Control of Pesticides Act 1986. The Countryside & Wildlife Act. Do remember when you instruct work to be done in Law you become the “Employer” which carries certain duties of care.